The Utopian voting stats for the month of March. March was a busy month for Utopian with the launch of the Indiegogo campaign. The largest changes to the voting breakdown came from an allocation of voting power to support this campaign and its marketing. The month also saw an increase in the number of different contributors rewarded and a small increase in the time taken to reward contributions, with both of these effects likely to be related to the above campaign. Overall the stats are fairly stable. Looking ahead to April, it will be interesting to see how the reduced voting power of Utopian affects the numbers. Celebrate another great month for Utopian using some summaries of the top 50 contributors. The overall contribution percentage (including task requests) for March 2019 was 63%. This level has remained pretty stable over the last 5 months. The significant rise in "other" is from votes made to support the Utopian Indiegogo campaign and its marketing. 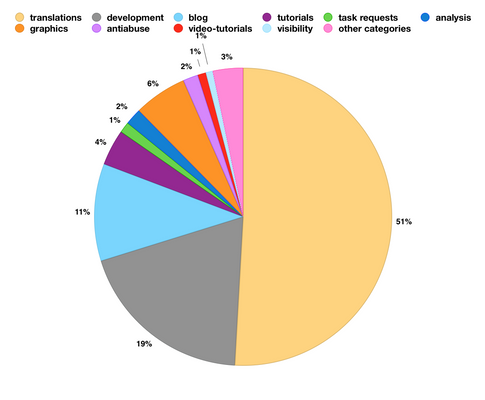 Contributions (blue): Utopian-io mainly rewards contributions to open-source projects. Contributions are not just limited to coding (development) but cover a wide range of technical skills including graphics work, translations, tutorials, copywriting, bugs and ideas. Moderator comments (purple): Utopian has a team of over 50 expert moderators who review and score every contribution. Utopian rewards the moderators for their work by voting on their review comments. 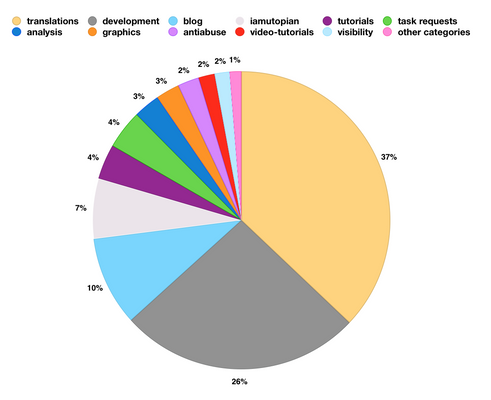 Task requests (yellow): Open source project owners can make requests for work to be carried out on their projects. These take the form of task requests. Only a small number of project owners currently use task requests but they can represent some of the most exciting opportunities for the Utopian community. Trails: Utopian-io also supports a number of Steem communities, typically those with links to the open-source world or science and technology. Two of these are separated out in the chart: steemstem (green) and mspwaves (red). Other comments and posts (grey): These are one-off votes on posts of high value or interest to the open-source community, such as the arrival of a new project into the Utopian VIPO club. There will also be a few votes that have fallen through the filters I use to determine the category separation. This second comparison takes the contribution vote and task request amounts above (blue and yellow segments) and separates them between contribution types for the months in question. There are fifteen contribution types (fourteen for October, with blog and iamutopian aggregated). Translations, up 2% from 23% to 25%. Blog, down 5% from 20% to 15%. A general increase in the smaller categories, led by graphics and ideas, both up 2%. Over the last six months there has been a slow trend of the smaller categories gradually increasing their vote share. Excluding the five largest categories (translations, development, blog, iamutopian, tutorials) the vote share for the remaining categories is now 23%, up from 15% in October. The following table looks at the number of contributors rewarded by Utopian-io in each contribution type, with a comparison against prior months. The comparison from February to March finally shows an uptrend in contributors rewarded with almost all categories in positive territory. This is likely to be due to the increasing Steem price bringing higher available rewards and the exposure for Utopian from the Utopian Colony campaign. The chart below looks at the timing of votes made by Utopian-io as measured against the seven day voting period for posts. The y-axis represents the duration in a post’s life at which it is upvoted by Utopian-io. The x-axis shows time across the month. The timing of voting shows a half-day increase for contribution votes, with the average delay increasing from around the 1.5 - 2 day mark in February to 2.5 days in March. This is likely to be due to the increase in manual "other" voting for the Utopian Indiegogo campaign (shown by grey circles on the chart). Manual votes made outside the voting rounds increase the time between each voting round and generally slow the contributions rewards process. As can be seen, in the last week of March there are fewer grey circles and the average time reduces back towards two days. Congratulations to all those who made it on to the top 50 list for March 2019! In particular congratulations to the top-rewarded contributor, who has climbed from 3rd in January, to 2nd in February and now 1st in March. Persistence! February top 50 for comparison. January top 50 for comparison. I used the block.ops analysis system to produce this study. Block.ops is an open-source analysis tool designed for heavy-duty analyses of the Steem blockchain data. The analysis used all the Steem blocks from the months analysed. This is approximately 900,000 blocks for each month. Loading the data for the relevant time period into block.ops. $ node blockOps utopianvotes "2018-11-01" "2018-12-01"
Moderator comments based on having the appropriate links to Utopian guidelines and help. Contribution post type based on the tags 'Utopian-io' and the first contribution type that appears. Special consideration taken for idea / ideas and social / visibility. Steemstem post based on steemstem vote. Task request based on the tags 'Utopian-io' and the first task-contribution type. mspwaves post based on msp-waves or mspwaves tag. Other posts and comments based on postComment indicator. Whilst I have made my best effort in this categorisation, I cannot promise to have allocated every post correctly. I upvoted your contribution because to my mind your post is at least 10 SBD worth and should receive 255 votes. It's now up to the lovely Steemit community to make this come true. Congratulations @miniature-tiger! You received a personal award!